SCROLL DOWN PAGE TO "SEND A MESSAGE"
Central Barwon Heads Walk Everywhere!! LARGE MAIN LIVING ROOM OVER 12 METRES IN LENGTH!!!!! Great holiday house accommodation with 4 bedrooms, 2 living rooms (very large main living/family room) and 2 Bathrooms (ensuite with spa). Plenty of room for 2 families (comfortably sleeps 11 plus a child's cot). central winter hub for relaxing holiday conversations!! Central Barwon Heads Walk Everywhere! All beds have mattress protectors, pillows and continental doonas. Guests to provide their own sheets and towels. Keys picked up on the propery via a secured PIN safe. Workers Playtime is highly sought after and has many return holiday makers - best to book early! Great family and pet friendly home! Perfect home for two families and pets, great location, has everything you need for a relaxing break. The property was everything it was described to be. It was a great place for three generations of family to stay. There was plenty to do in and around Barwon Heads but we had forgotten how busy the town becomes on weekends. Excellent. Great yard for kids and the dog! Perfect for what we needed. 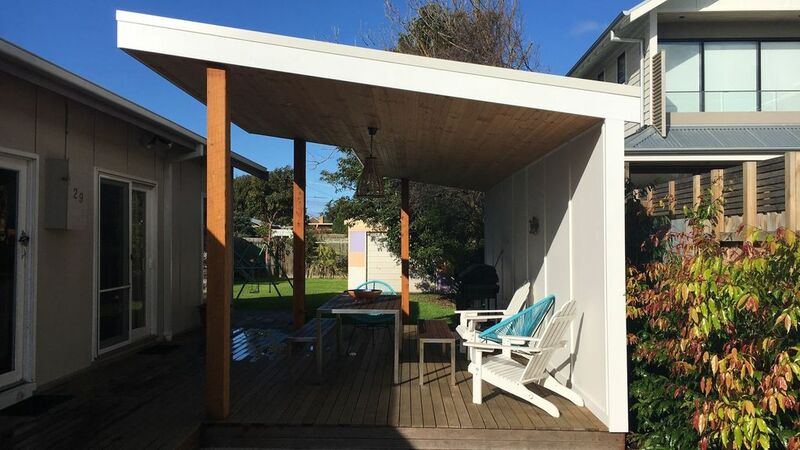 Walking distance to beach, shops and cafes, and a great yard and cubby house for the kids. Definitely recommend. Perfect property for our needs, everything you could want for a long or short stay on the Bellarine. Walking distance to park, river, shops and beach. Quiet location, great yard for our dogs, awesome shower, comfy bed, neat and tidy. Would definitely stay here again. Fantastic house on a big block with a wonderful holiday feel. We had a fantastic time in this lovely house - it is spacious and clean with plenty of room for two families . The outdoor areas were great with a backyard big enough for games of cricket and a swingset and cubby for the little ones. The decks were great too with a great undercover bbq area close to the hose We really felt like we were on holidays down the beach as the house felt welcoming and relaxing . Would love to return and definitley reccomend this place to families . Great place for a family or two with plenty of room and a great yard for the dogs. We really enjoyed our stay. With indoor and outdoor eating and relaxing areas it met all our needs. The dogs were able to run around safely in the yard with plenty of shade when needed. Being able to walk to the shops, river and beach was wonderful. The area had lots of local eating places and markets to visit.